I visited Auckland for about a month last year and I was able to meet Nikki and check out her studios in Ponsonby and Newmarket. This year my boyfriend and I were getting things together with visas (he's Australian) and we decided New Zealand would be the best choice. The allure of touring on our bicycles here also weighed heavily into the decision. So we moved here from Portland, Oregon and settled in immediately. I've been teaching 4.5 years and can say traveling is an infallible part of growing as a teacher. I'm happy to call New Zealand home for the time being. I originally went to Photography school earning a Bachelors Degree in Still Photography from the Brooks Institute. It was there in Santa Barbara California that I found yoga. Whatever I was doing physically I would photograph it. for its clear demonstrational aspect but also for the potential beauty there is to create. Especially when done outside. 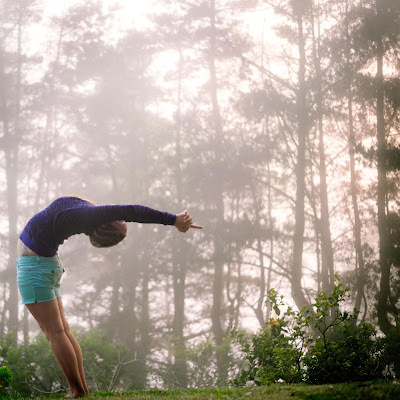 Put a human in a beautiful natural landscape and to me the scene demands a little yoga. Getting yourself to a level thats in step with the sun and moon and earth under your feet while breathing and being still...I don't know what's better really. So to me that should also be photographed. What are some projects you are working on at the moment? Photographing the city. Doing stuff with the Magic Carpet Yoga Mats outside. I need to take them out to a beach and give them a good practice. I am interested in photographing studios here in Auckland, I've heard there are some nice spaces. Right now my boyfriend Kaspar is my favorite yogi to photograph. He's a new yogi and its cool to see his postures change. What feelings do you wish to invoke with your photographs? Fun. I'm always tying to have a good time. So that's what I want to take pictures of. The fun stuff I do with my life. I like photographing with natural light and I definitely like taking pictures of people the most. With my yoga photography I'd like to be able to stir an emotion with my images that makes someone want to do something about themselves. Move themselves. Into a shape, into an asana. And find the potential in their own body. Why do you choose to practice Bikram yoga? Hatha yoga, clear concise instructions and heat. It's challenging, its healing, its rewarding. We're all practicing hatha yoga in some way or another and I happen to like the way Bikram teaches hatha yoga. Bikram also reaches a lot of people who wouldn't normally try yoga. I've met so many different kinds of people practicing and teaching this yoga. I like getting to know an eclectic group through trying yoga together. And it holds true all over the planet. Being a part of the Bikram yoga community is like having friends and family around the world. But I really love all yoga. It makes me feel good no matter what style or tradition. Bikram Choudhury's combination of 26 postures and 2 breathing exercises makes me feel the best.